The River Valley Road/Groat Road Interchange approved concept plan is now available for review. A summary of What We Heard from the May 26 – June 15, 2015 online survey about the project’s Recommended Concept Plan is also available for review. 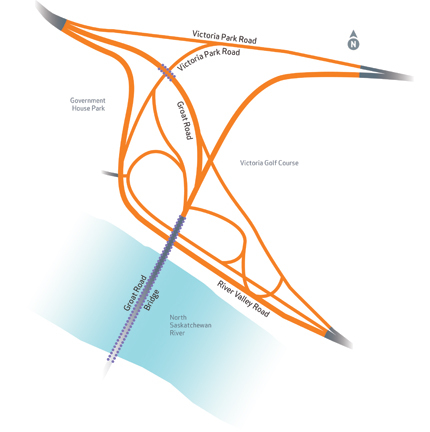 The City of Edmonton is developing a long-range concept plan for the River Valley Road / Groat Road interchange. The area serves as a commuter and recreational route for all forms of traffic, including cyclists and pedestrian, with access to the downtown area, the University of Alberta and the River Valley park system. Any recommended reconstruction resulting from The River Valley Road / Groat Road interchange planning project will not overlap with the 102 Avenue over Groat Road Bridge Replacement project currently underway. The anticipated completion date for bridge replacement is fall 2015, while the earliest construction could start on this project is 2016, and only if funding becomes available. This concept plan does not include any modifications or improvements to the bridges in the area. Input from stakeholders was collected in September and October 2014, with an Open House to present draft concept plans on November 19, 2014. The recommended concept plan is now complete. There is currently no funding identified for the construction of improvements at the River Valley Road / Groat Road interchange, therefore exact construction timelines are unknown.